If your facility needs an SPCC Plan, it will be classified into one of three types of facilities. Your facility classification will determine how your SPCC Plan must be prepared. 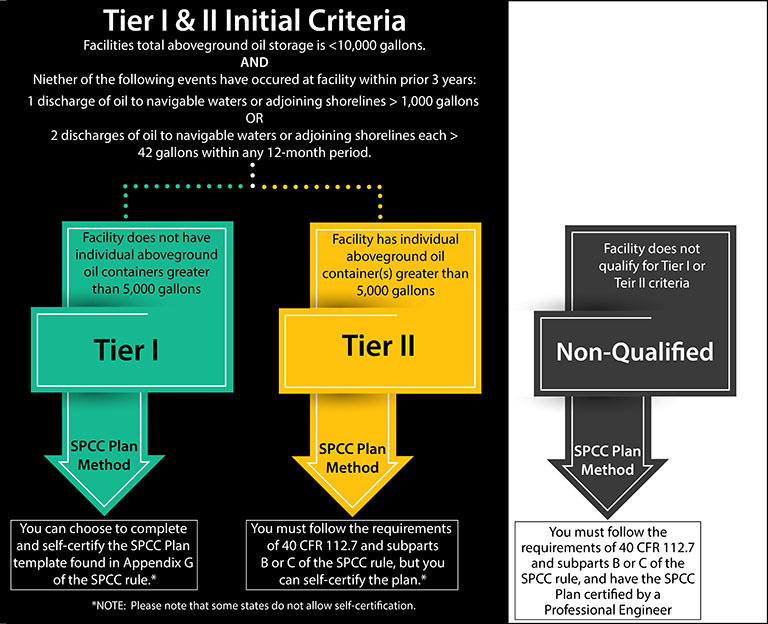 To find out what classification and SPCC Plan you need, see the graphic below. Every SPCC Plan must be prepared in accordance with good engineering practices and certified by a Professional Engineer (PE) unless you are able to, and choose to, self-certify the Plan. Williams & Company has joined with Environmental Advisors and Engineers, Inc. in putting together a team of specialists to assist facility owners in their compliance with the EPA’s regulations on SPCC Plans. The team of specialists has skills in engineering, law, accounting, risk management, and information management. Williams & Company not only provides an excellent SPCC Plan (click here to see sample SPCC Plan) but we also provide SPCC employee training and SPCC recordkeeping (through Dashboard Advantage) addressing the most common EPA violations. In addition, we stand behind our SPCC Plans. If the EPA issues you a violation for an exception we did not note in the Plan – we will reimburse you the amount of the fine up to the cost for your SPCC Plan. For details see our sample SPCC agreement. Contact us today at 877-269-0194 or by email.